Piazza Navona (Pia), age 15 in the front and Saracina, age 7 in the back, both Pastore Maremano Abruzzese from Italy. 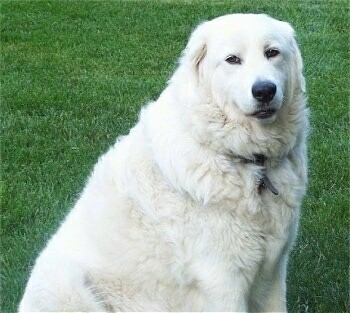 The Maremma Sheepdog is a massive, noble, distinctive-looking dog with a bear-like head. The jaws are strong with a scissors bite. It has a black nose that often becomes slightly pink-brown with age. The ears are V-shaped, pointed and rather small. The eyes have a lively, intelligent expression, but are not large. The nasal canal is straight. The tail is low set and thickly feathered with dense hair. The deep, well-rounded ribcage extends to the elbows. The long, harsh and very abundant hair has a slight wave. The undercoat is dense. Coat colors include white with markings of ivory, light yellow or pale orange on the ears. 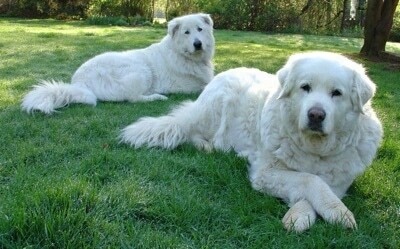 The Maremma is a friendly and well-balanced flock guardian. For several decades, it has also achieved success as a companion dog. Sober and dignified, this loyal, brave and determined dog makes an excellent guard dog without being a constant barker. It is correctly described as affectionate, but not dependent. Working lines that are put out to work will not easily follow your every command submissively, as they are bred and trained to be independent. You must display calm, but firm, confident and consistent leadership toward the dog in order to make it listen. It is very intelligent and its training requires mutual respect in handling and voice, and above all, consistency. 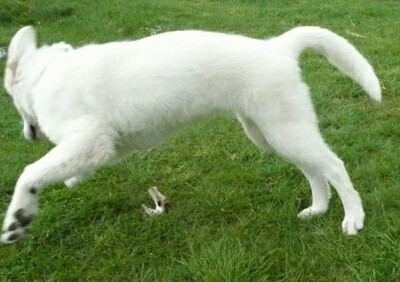 It gets along with other dogs and pets and can be slightly reserved with strangers but not strongly so. People who are not welcome on your property will be stopped in their tracks. The Maremma is not as large as many of its fellow flock guards, but he still possesses comparable endurance and strength, as well as the ability to make up for the extra 50 pounds it lacks. It is alert and independent. A flock guard of impressive dominance and lifelong dedication, this breed takes control over its flock. When humans are part of the dog's pack, the humans must be pack leader over the dog. Allowing any dog of any size to be a human's pack leader is dangerous, as dogs instinctually communicate their displeasure with a growl and/or a bite. Humans who keep flock guard type dogs as companions must understand how to calmly, but firmly display their authority over the dog. Passive owners will not have a successful human/dog relationship. 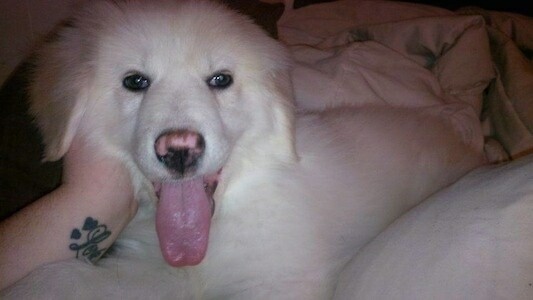 As a pet, the Maremma is not very attached or overly outgoing. Nevertheless, this rugged wolf-slayer breed has adapted into a marvelous companion, without losing its extraordinary working abilities. It will defend both house and master, and it is particularly attentive with children. 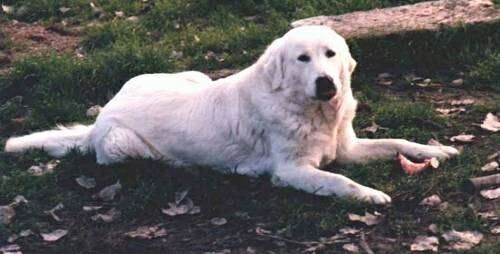 The Maremma is a marvelous sheepdog and loves its work. It is a terrible enemy of the wolf, but tame with man. Held in high esteem by shepherds, especially in the mountains where it thrives in the snow it is resistant to both cold and brambles. This is not a breed for beginners. The Maremma Sheepdog is not recommended for apartment life. If it gets enough exercise, it will be calm indoors. Accustomed for centuries to wide-open spaces, it needs at least a large yard. The all-weather coat allows it to sleep outdoors. The Maremma is not well-suited for very hot weather. It should never be shorn, but should always have plenty of shade and a large bowl of water on hot days. This breed needs space—mental as well as physical. If it is not working as an active flock guardian, it needs to be taken on daily, brisk walks. A short walk around the block three times a day is not enough for this dog. Long and alternating walks are necessary. It must have frequent opportunities to run free. When it gets enough exercise, freedom and space, it will be quiet in the house. The all-weather coat requires regular, thorough combing and brushing to remove all dead and loose hair. Take extra care when the dog is shedding. Some claim at one time there were two separate breeds: the Abruzzese and the Maremmano. The Abruzzese was more of a mountaineer and had a longer body, while the Maremmano had a slightly shorter coat. 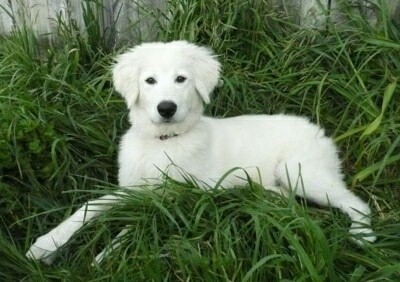 However in the 1950s the two were officially established as a single breed with a hyphenated name, Maremmano-Abruzzese. 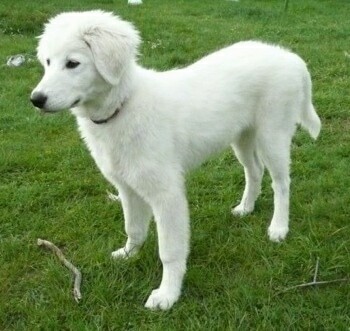 This is a classic European flock-guarding dog, probably a close descendant of the great, white Eastern sheepdogs that slowly spread across Europe over 2,000 years ago: the Karabash and Akbash sheepdogs of Turkey, the Kuvac of Slovakia, the Kuvasz and Komondor of Hungary and the Pyrenean Mountain Dog of France are all included in its blood. 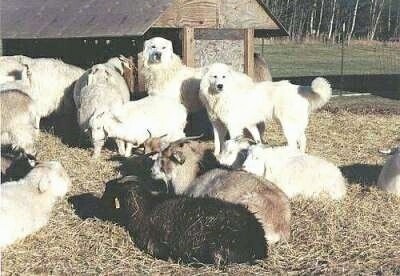 The ancestors of the Maremma evolved to become smaller than their fellow herd guardians while retaining the independence and aloofness of their heritage. Although it is now seen regularly in Great Britain, this breed is still rare in other countries outside Italy. It is strong-willed and not easy to obedience train, but makes a super guard. Its country of origin is Italy. 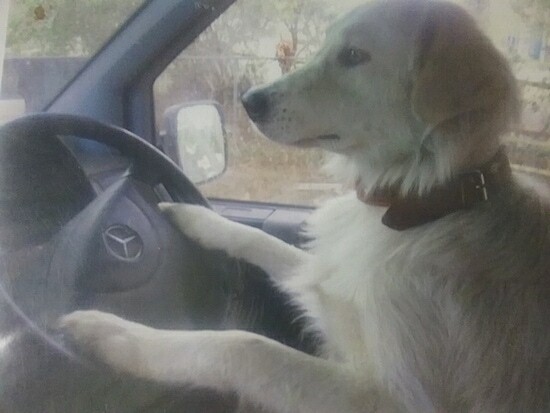 Spirit the Italian Sheepdog (Maremma) from Australia at 2 years old—"Spirit has a lovely soft nature and unlike other Maremmas she hardly ever barks, only if there is danger. She meets strangers gently, as well as other animals. She had adopted an abandoned stray cat and later kitten. The first she patiently coaxed inside, ignoring cats snarls, coaxing him towards her food. They became inseparable and the cat grew up never leaving Spirits side. The cat went for long walks with him, so we called him Little Dog. Little Dog sadly went away to cat heaven with a bad case on Dunlops Disease (car tire). He missed him badly and about 6 months later he adopted a black kitten MErlOW. They both eat and sleep together, although MErlOW is afraid of other dogs, he is still a stray and pops in for days at a time then disappears. Spirit now has a new mate, VINO, a 10 week old purebred imported Italian Sheepdog that MErlOW is not sure of, but accepts him as Spirits friend." 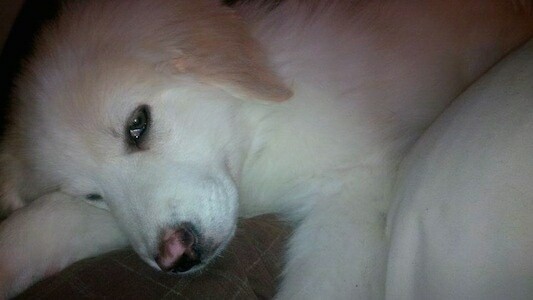 "These are some pictures I managed to snap of our Maremma Sheepdog puppy Lulu. She's now about 4 1/2 months old (and already as big as our Lab / Greyhound cross boy! ), and she's now at that age all puppies eventually (inevitably) reach—the age of realization that there is a whole other world that exists above their eye-level! She's not much of a runner, but she does enjoy flailing about and running around like a goon, and she never fails to greet us at the door or in the morning with a big, toothy, cheesy Maremma grin. She's a menace, but we love her anyway!" 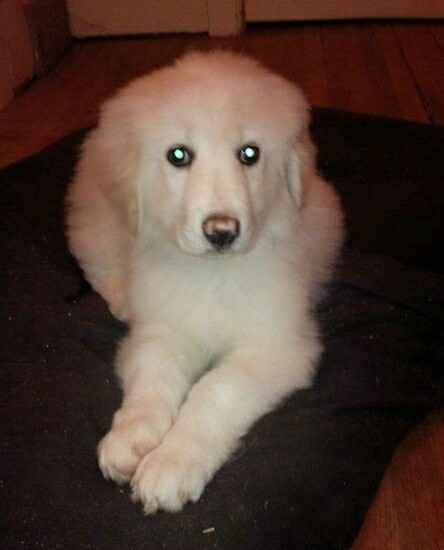 Hanna the Maremma Sheepdog puppy at 11 weeks old—"Hanna is a very sweet nurtured Maremma pup! She went from living in a barn ready to become a farm dog to a pampered house pet and is enjoying every moment. She loves to snuggle and cuddle."